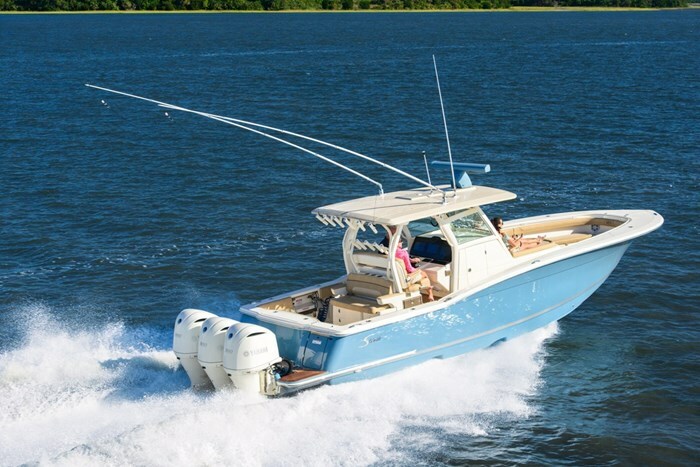 Scout Boats are built just outside of Charleston, South Carolina just up the river in a small town called Summerville. If you visit the factory, there is probably a high probability you will run into the founder, Steve Potts. Potts is still heavily involved on the shop floor as he loves to know every detail about his boat, inside and out. 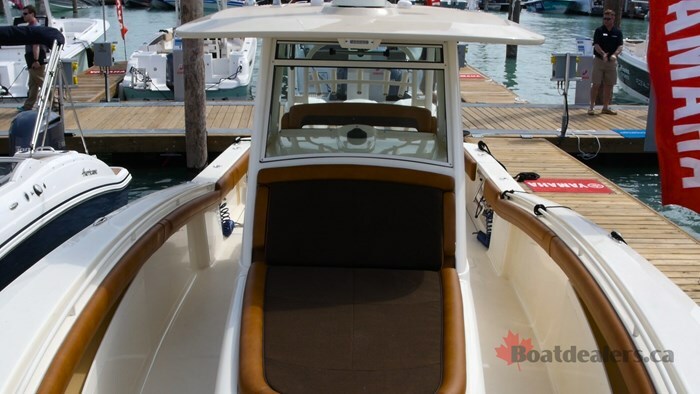 Which is part of the reason Scout Boats has become an industry leader in the segment in just a short period of time, with their first boat coming off the line in 1989. Scout’s LXF line features boats from 25 feet, all the way up to 42 feet. The LXF stands for Luxurious Sport Fish but if you walk aboard one of these boats you’ll see it’s just as much luxury as it is sport fish. 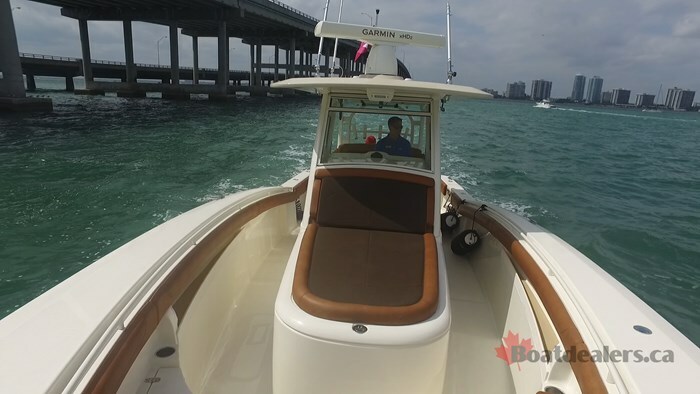 Not saying that the 350 LXF that we tested was lacking in fishing features by any stretch, but it’s just awe inspiring from the moment you walk aboard. Boarding the 350 LXF is easy thanks to the transom gate and when you step into the cockpit you can tell by the layout that this is still a serious fishing boat. The cockpit is open and ready to fight fish. 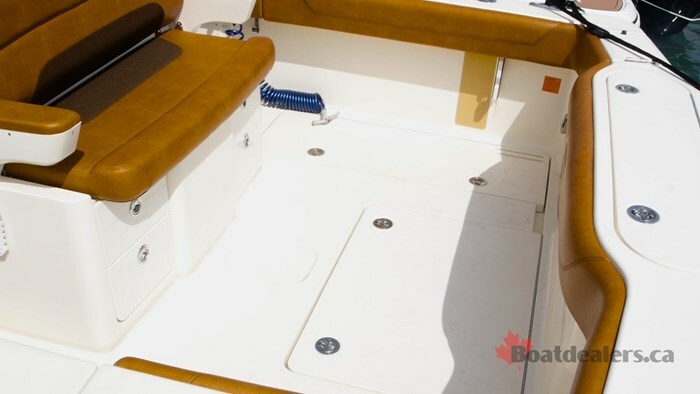 The vinyl used throughout the boat was a rich brown, like a distressed leather look that really added class to this package. The coaming bolsters that wrapped the entire boat featured this same vinyl also that was soft to the touch and plush against the legs should you want to fight a fish or simply just hang out and sit on the wide topsides. Fish boxes a plenty, this boat has a 60-gallon box in the transom, along with two in the floor. The great thing about a fish box is that they make great storage compartments because they are cleanly finishes, insulated and have a drain. This is an ideal storage solution, but be prepared to empty it out and fill with fish should you get on a school quick! 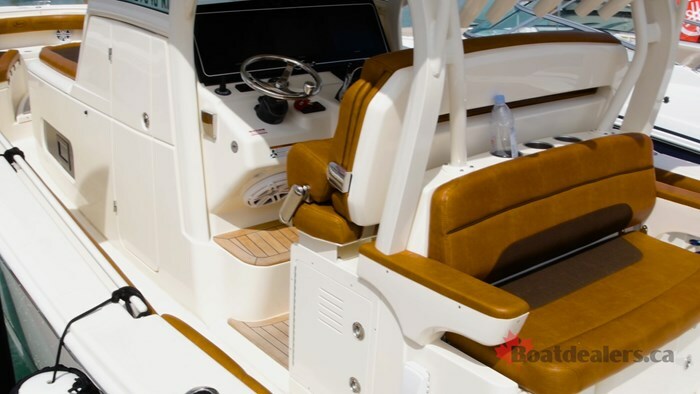 Forward of the transom you will find a large, elevated bench seat with arm rests. This seat is perfect for watching your lines as you’re trolling, but it also serves as tackle storage and bait well. There are two tackle drawers below the seat that slide open. The seat itself lifts up and reveals your large baitwell. The center console, T-top and the seat I just talked about, are all part of one integrated unit that has the helm built in as well. When you’re at the helm of the 350 LXF you feel like you’re at command central. The first thing you will notice are the two large, touchscreen displays that take up the full width of the console. It’s a clean layout with the wheel and throttle controls mounted slightly off to the left of center. What I liked about the 350 LXF was the seat truly was a double duty seat. It could be used as a leaning post, or an actual seat as it has an elevated foot well that’s perfectly placed for comfort on those longer cruises. The hard top covers you from the elements and the console is protected by glass. Should you want a little air flow the forward glass segment slides down to keep the air flow going. The spot you’re going to want to be however is forward of the console. Normally this spot is reserved for a twin jump seat, for you to sit upright, but in the case of the 350 LXF you get a massive lounge. This lounger is very purpose filled which I’ll explain coming up, but sticking with the lounger it’s like a large, double chaise lounge. The backrest falls into the natural style of the 350 and it’s large enough for you to kick your feet out in front with lots of room to spare. What I meant when I said this lounger is purpose built is two-fold. The first of which is if you release the latch forward of the lounge the whole thing lifts up on gas struts. Here you will find lots of storage, a spot for your standard dive ladder and a great spot to stow your shore power cable. But in the bigger picture, this extra space is most notably used below decks, where instead of simply a day head but you have an entire quarters with sink, counter for meal prep and facing seating. This seating also converts into a bed. It’s not a king size mattress, but it’s a great spot to catch a siesta. Going back topside you will find a great seating lounge in the bow section of the boat. In the floor of the lounge you will see a teak section. As if to appear from nowhere, this section rises out of the floor to become a table for dining. Having given the Scout 350 LXF a proper walk through, I had enough of sitting still. When you have triple 300-hp Yamaha’s sitting at the transom you can only stay still at the dock for so long. Especially when you know about Scout’s legendary double stepped hull. As we left the dock and idled out to the open water at the Miami boat show, the captain of the 350 explained to me how Scout recently changed the build process of the 350. They recently switched to a vacuum infused process. They still hand lay all of the materials in the mould, but then they would put it all in a big bag and seal it tight. The result of which was all of the excess materials would be pulled out. 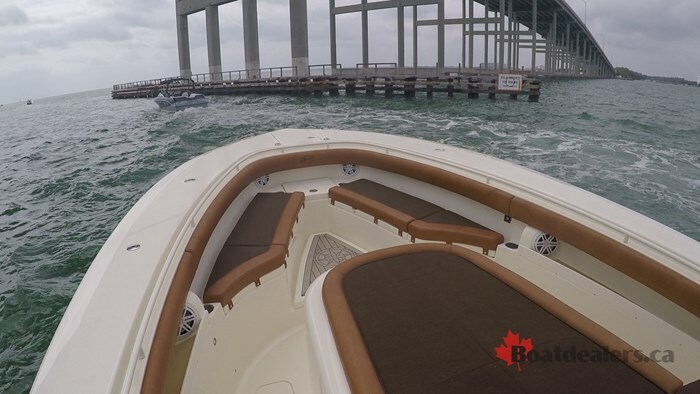 This leaves you with a boat that is up to 600 pounds lighter than it was in the past, without being even slightly compromised in strength. What I find cool about Scout boats is that, at least for those of us who don’t get to experience them every day, you have to be reminded they’re a Scout. So what I mean by this is we were dealing with a particularly choppy test day. So when we put the throttles down and the 900-hp surged the 350 onto plane in 5 seconds, I held on tightly. But then you get up on plane and the dual stepped hull takes over and you loosen your hold a touch. It’s like “oh ya, this is a Scout.” The way it glides over the waves was a thing of beauty. 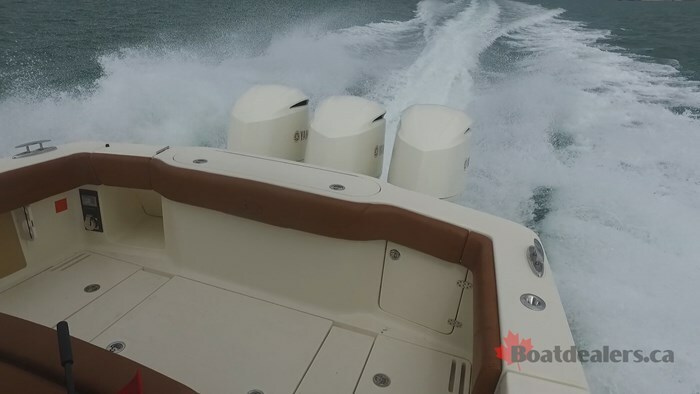 The benefit of the dual stepped hull is that it’s constantly adapting to the running conditions as basically you have 3 distinctly different running surfaces. I came quickly to realise that what I thought was rough water wasn’t even close to rough water for this boat. So much so that we were able to comfortably cruise around 60-mph. We weren’t even trying to figure out the top speed at this point, we were just cruising and I looked down and was almost shocked we were going so fast. I hold Scout Boats in the highest regard, but it’s a regard they have earned. One of the first boats I ever tested many years ago was a Scout and since then I revel at any chance I get to get back on them. This 350 LXF was sport, function and class all wrapped into one.